During this time we have built a reputation for reliable service with a very high quality level which, we believe, is unrivalled locally. We offer a truly comprehensive service for all your needs in general and cosmetic dentistry, including implants. The Practice door is always kept open for all patients – existing and new ones. Vivek qualified from King’s College, London, UK in 2000, gaining a distinction in his BDS degree. In 2003 he successfully completed his membership exams for the Royal College of Surgeons. Vivek joined WRDP in 2007. Viraj Graduated from the Barts and London in 2011,Viraj completed his membership exams at the Royal collage of surgeons in 2004, he also gained his certificate in Aesthetic and Restorative dentistry, Viraj went onto completing his diploma in implant dentistry at newcastle university in 2017. Iker qualified from Universidad del Pais Vasco, Bilbao, Spain in 2004 . In 2006 he gained a Certificate in Dental Implants. Iker obtained his 3 year MSc in Restorative and Cosmetic Dentistry from Warwick University. He joined our practice in 2008. Prakash graduated in dentistry in 2001 and spent the early part of his career gaining experience in Oral & Maxillofacial Surgery. Prakash comes carries out facial and beauty procedures as well as complex surgical cases. Iain qualified as a dentist in Cape Town, South Africa in 1985. Since then he has always worked in general practice. In 1989 he started to work in the U.K. and joined Western Road Dental Practice in 1992. His special interest is treating nervous patients and he is qualified and very experienced in providing inhalation and intravenous sedation. Jennie started her career in Dentistry as a dental nurse and qualified in the National Certificate in 2004, she went on to furthered her career at University of Essex and qualified as Dental Hygienist in 2014. Jennie joined the practice in March 2017. Vilma Jonylaite qualified as a Dental Hygienist in 2001 in Lithuania, she is very passionate about oral health and constantly seeking to renew her learning in dental hygiene and prevention. Vilma joined the practice December 2016. Stacey started working at WRDP in 2007 as a Dental Nurse, she progressed in her role in 2016 and became our Practice Manager. Katy is our Head of Reception since 2009. Mez recently joined the practice in September 2016, she qualified in her National Certificate in Dental Nursing in 2014. Mez is very committed and wishes to continually develop her skills within her profession. Emily joined the practice in August 2015. She recently completed her National Certificate in Dental Nursing in London. We treat everyone as an individual with feelings. We know that most people dislike going to the dentist or having treatment and that they can respond in different ways. Some are quiet, some are impatient and most are nervous. We are always understanding and forbearing, professional, friendly and in control. We always welcome NEW PATIENTS AND FAMILIES to our practice. When you first walk into our reception area you will find a friendly, nice and relaxed atmosphere where you can book appointments or enquire about our services. Our waiting room offers daily newspapers, magazines, TV, water cooler, soft and hard seating and a children activity corner. We also have fully disabled access from street level and a secure FREE Car Park at the rear of the practice. WE follow a very strict GOOD PRACTICE COMMITMENT to provide dental care of consistently good quality, for all patients. We only provide care that meets your needs and wishes and we will make your treatment as comfortable and convenient as possible. We will use disposable instruments and materials whenever possible. We follow the General Dental Council and the British Dental Association’s guidelines on cross infection control. We will look after your general health and safety while you are receiving dental care. We will give you a printed itemized estimate before commencing any treatment. We routinely check for mouth cancer. Our staff members take part in continuing professional development and we retrain yearly on CPR and emergency procedures. We welcome feedback from patients and we will deal promptly with any complaints. Our visiting Specialist Dr Promod carries out facial enhancing treatments. 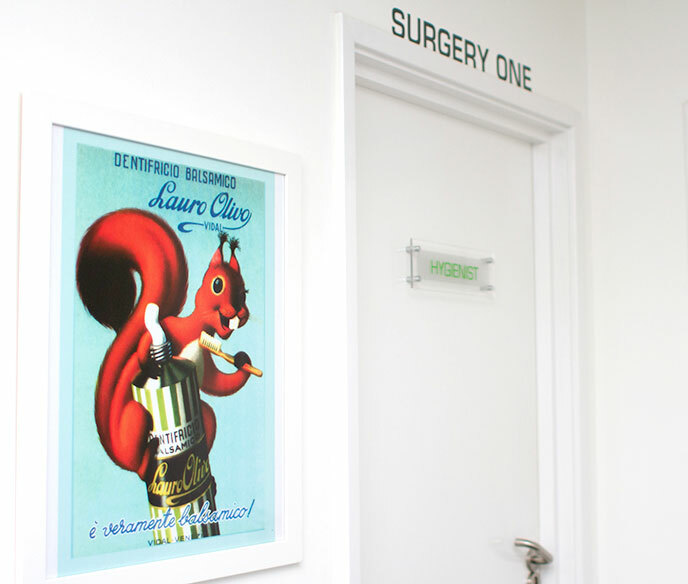 We provide an “Out of Hours” emergency dental service 365 days a year, everyday until 9pm. This is service is exclusive for current patients. New patients who need an emergency appointment are welcome to walk in or book an appointment during regular opening hours. WE operate a practice complaint procedure which adheres to national criteria. If you have a complaint or concern about the service you have received from your dentist, hygienist or any of the staff working in this practice, please let us know at your earliest convenience. Complaints about the treatment you received should be made to the dentist who normally sees you. Alternatively, you may ask for an appointment in order to discuss your concerns or email us at Manager@ROMFORD-DENTAL.CO.UK. It will help if you are as clear as possible about your complaint. We shall acknowledge your complaint within 2 working days and aim to have looked into your complaint within 10 working days of the date when you raised it with us. We shall then be in a position to give you an explanation, or offer a meeting with those involved. The appointment times available for individual dentists and hygienists vary. Please see the dentists and hygienists usual times under FAQs or contact us for more details by telephone or e-mail. The practice is closed on Sundays and Bank holidays. From Monday-Friday there is a dentist on call for emergencies after hours from 5.00pm – 9.00pm and at weekends and bank holidays from 9.00am – 9.00pm. Q: HOW CAN I REGISTER AS A PATIENT? A: All you need to do is phone us on 01708 203 146 and book an initial consultation with a dentist. Please check YOUR FIRST VISIT to find out more. Q: IS TREATMENT FREE FOR MY CHILDREN? A: Yes, all our patient’s children benefit from FREE check ups and FREE dental treatment until their 18th birthday. Please check UNDER 18s GO FREE to find out more. A: Yes, we offer 10% discount to patients joining Denplan Essentials, except on orthodontics and dental implants. When more than one family member joins Denplan further monthly discounts (up to 15%) are applied on your monthly payments. We do not operate any further discount policies. A: Please check YOUR FIRST VISIT to find out more. Q: I AM VERY NERVOUS. HOW CAN YOU HELP ME? A: In addition to a careful and gentle approach we offer an intravenous or RA sedation (Gas and Air) for very apprehensive patients and/or extremely uncomfortable treatment. This also helps in strong cases of gag reflex. Q: IN AN EMERGENCY, CAN I JUST WALK IN? A: Yes, we aim to see all emergencies on the same day. However, to avoid dissapointment we strongly recommend you that you call us ahead on 01708 203 146. We operate an OUT OF HOURS services until 9pm 365 days a year for our registered patients. Please check EMERGENCIES to find out more. Q: DO YOU HAVE A FREE CAR PARK? A: Yes, we offer free undercover car park for the duration of your visit. Please type in your car registration number at reception to avoid a penalty fee. Q: CAN I SEE THE HYGIENIST WITHOUT A DENTAL CHECK UP? A: No. You will be asked to see a dentist at least once a year to ensure you are dentally fit. You may be refused a hygienist appointment if you have not seen a dentist recently. A: Yes, please download our Fee Guide here. Please note that this is a guide for your reference only. You will receive a written itemised treatment plan once you have attended your examination. Q: I AM A WHEELCHAIR USER. CAN I ACCESS THE PRACTICE? A: Yes, we have full disable access from street level to the dental chair for wheelchair users and baby push chairs. We have a full disable toilet with ample entrance a low sinks as well as baby changing facilities. Please ring the bell on our front door for assistance entering the building. Our reception has a low desk area to fill up forms and make payments. Q: I AM BLIND. CAN I BRING MY GUIDE DOG? A: Yes. Guide dogs are the only pets permitted within the practice. Q: DO YOU OFFER FINANCE AND PAYMENT PLANS? A: Yes. We offer interest free credit finance through DENTAL FINANCE and monthly payment plans with DENPLAN. We also accept all major dental insurers. Q: I AM INTERESTED IN A FULL MAKEOVER OF MY SMILE. CAN YOU HELP ME? A: Yes. We try to provide our patients with the least intrusive dental treatment and keep the appearance of your smile looking very good and also as natural as possible. We have a specialist prosthodontist and a surgeon in our team who will be happy to advise you in individual cases of advanced and complex treatment. A number of options will be explained and offered to you so your decision to accept a treatment plan is made with all the necessary information and with your full consent. Q: I AM INTERESTED IN HAVING AN IMPLANT. CAN YOU EXPLAIN ME BRIEFLY WHAT EXACTLY IMPLANT IS AND HOW IT WORKS? A: A dental implant is a precision made titanium metal post which is placed into the jawbone to replace a gap where a tooth has been lost. It is used to support one or more crown units or a denture. Modern implants often last for at least 15 years – possibly for life. The advantages of an implant is that it is fixed, it stops the shrinkage of gum and bone and there is no damage to adjacent teeth. An implant is the most cost-effective long-term solution for a missing tooth or a number of teeth if there is enough healthy bone in the jaw. In other case it may still be possible to place an implant by grafting bone into the area first. Placing the implants requires a small operation. This can be carried out under local anaesthetic alone (dental injection) or with sedation. You will not feel any pain at the time, but you may feel some discomfort during the week following the surgery. This is usually due to having stitches in place, and the normal healing process. Usually the implants need to bond (integrate) with the bone after they have been placed. This takes from 3 – 6 months. If you are having one, two or three teeth replaced, you will have a temporary restoration in the meantime. If you have complete dentures, you can wear them throughout the healing period once they have been adjusted after the surgery. It takes about 9 months from the initial assessment to the time when the artificial teeth or dentures are finally attached to the implants but a lot depends on how complicated your treatment is. Our specialists will be able to give you a timetable. Please make sure you understand exactly what treatment is proposed, the total cost of the treatment and what the alternatives are. If you are unhappy with any of the answers then do ask for a second opinion. You will be spending a lot of time, effort and money so you must be sure that you know what you are getting at the end of treatment. Q: WHAT ARE THE OTHER ALTERNATIVES OF REPLACING MISSING TEETH? A: The other main options are dentures and bridges. Q: WHAT ARE THE ADVANTAGES AND DISADVANTAGES OF THE MENTIONED OPTIONS? A: The advantage of a denture is that it is cheap. The disadvantages are that they can move when eating, speaking, laughing or smiling. There is the possibility of damage to the gums. The gums and bone often continue to shrink, and the life expectancy of high-quality dentures is 5 – 12 years. The advantage of a bridge is that it is fixed. The disadvantages include an average life expectancy of high quality conventional bridgework of 7 – 15 years. For conventional bridgework the adjacent teeth usually have to be drilled and cut down, this is not so for adhesive bridgework, but this type can de-bond and fall out. Gum and bone levels usually continue to shrink, and the bridge margins can become unsightly due to recession after a few years. The only known disadvantage of an implant so far is the higher initial investment, and the possibility of a longer treatment timeframe. Q: IS IT POSSIBLE TO HAVE A BRILLIANT, WHITE “HOLLYWOOD” SMILE? A: Usually yes. Please consult your dentist for the best advice of how to get your dream smile. Q: I WOULD LIKE TO BLEACH MY TEETH BUT I AM CONFUSED AS THERE ARE VARIOUS WHITENING SYSTEMS ON THE MARKET OF VARYING QUALITY AND PRICE. WHAT YOU WILL RECOMMEND? A: As professionals we believe that the best treatment is the safest one which gives the desired results. Therefore bleaching(tooth whitening) should be only done on the recommendation of your dentist and carried out under his or her care and close monitoring of the whole process. We offer two kinds of tooth whitening. Power bleaching (this is carried by the dentist in the surgery for approximately two hours with immediate results using a high concentration of peroxide) and home bleaching (impressions are taken by the dentist of the upper and the lower teeth, sent to a dental laboratory to make the close fitting trays and a follow up appointment is made to allow the dentist to provide instruction on the use of the trays, administering the bleaching gel and a written instruction sheet will be given to take home. In approximately two weeks time a short review appointment is made so the patient and the dentist can discuss the results achieved. Some patients may suffer a variable amount of sensitivity during and immediately after treatment which is to be expected but if needed a dentist will take a closer look to confirm that everything is normal and there is nothing to worry about. A special tooth paste is provided for the most sensitive moments. The sensitivity goes away when the bleaching is stopped. As the home gel is less concentrated and is more gentle to the teeth and gums home bleaching is recommended as the preferred option in most cases. In some cases combined teeth whitening can be recommended. The colour of the teeth usually never returns to the original shade but a top up is recommended after 6,12 or18 months to keep the teeth looking good. Re-bleaching for couple of days may be necessary if a lot of coffee, tea, red wine, curry, etc is consumed. Q: CAN I CHANGE MY MIND FOR A TREATMENT ASSESSED BEFOREHAND? A: Yes. You will only need to provide us with enough time to re – schedule your treatment and any costs done towards the abandoned treatment will be on your expense and the Practice will not be liable to refund you for those. Q: ARE THERE CANCELLATION FEES? A: Yes. If you fail to attend or you cancel within 24 hours of your appointment you will be charged a cancellation fee. However, if this is the first time it happens, we may ask you to just pay a deposit in order to rebook. This applies to Private and Denplan patients, as well as under 18s. Q: I FORGOT TO TYPE MY CAR REGISTRATION IN RECEPTION. WILL I GET A FINE? A: Yes. Unfortunately you will have to raise a claim with the Car Park firm which runs our parking spaces. This runs independently from our business. We can help by printing treatment plans or payment receipts which show you attended the surgery on such day. We cannot cancel your fine. Please take your time to type the correct reg number. Q: DO YOU OFFER NHS TREATMENT? A: No. We offer just private treament with an initial consultation fee of £50. If you join our Denplan schemes, your regular check- ups, x- rays, hygiene appointments and dental treatment will be included from £14 per month. Please ask your dentist about Denplan. WE are here for you in the long term and we hope that in WRDP you will find the dentist that you have been looking for all your life. Please check who we are HERE.